Please stop tagging Personal Images for deletion on the Super Mario Wiki. This isn't a warning, and it's possible that you made a mistake by accident or without realizing it; this is simply a reminder for your information. If the action continues, then a warning will be issued. Thanks for reading and keep contributing. Hello. In regards to your edit here, that image was marked as a Personal Image (that means the user is free to use it however they want, regardless of whether it is able to be used on any mainspace articles). Please don't tag such images for deletion, thanks. This is a warning to stop your inappropriate behavior (Spamming) on the Super Mario Wiki. Please adhere to the rules or you will be blocked from editing this site. 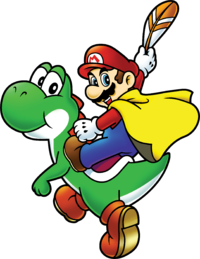 This is a warning to stop your inappropriate behavior (creating more than three featured article nominations) on the Super Mario Wiki. Please adhere to the rules or you will be blocked from editing this site. This was very unacceptable. We call that spam, and that's a level three offense. On top of this, your past warnings as well as frequent negligence to the rules has earned you his Last Warning. I suggest that you read over our policies and help pages. Thanks. Didn't he already get a warning for this? This page was last edited on August 18, 2016, at 00:24.